Today I’ll be sharing some tips on Mood System. 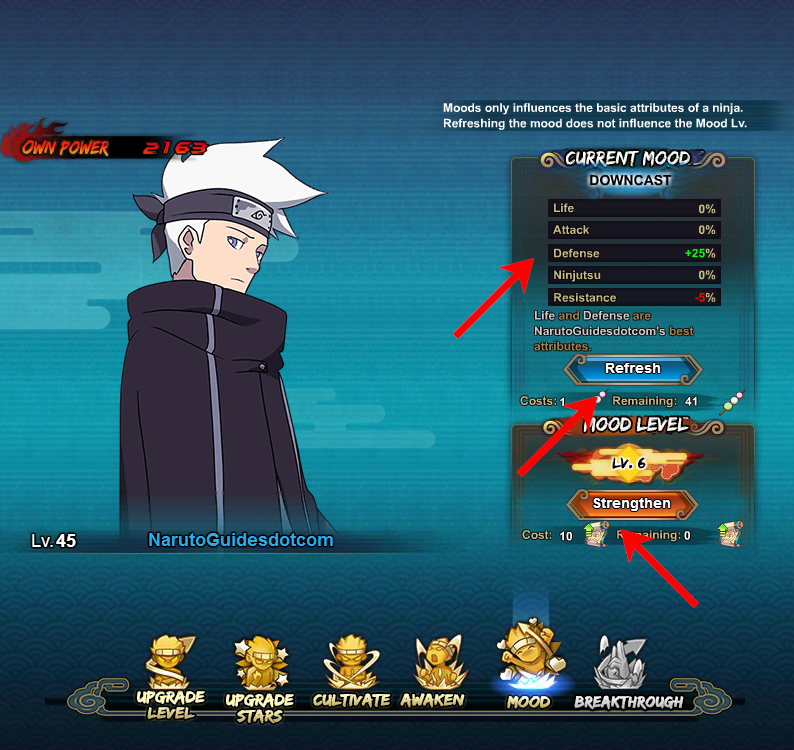 In Naruto Online Game the mood system gets unlocked at level 32. So what you need to know about Mood System? Mood System will help your ninjas to increase their basic stats which are Life, Attack, Ninjutsu, Defense and Resistance. However, you need to sacrifice one of your other stat to increase specific stat of your preference. You need to have a strategy when you increase the mood level for your ninjas and main character. For example, if you’re using Breeze Dancer you may focus on increasing her Life, this is because her Clone skills depends on the percentage of Life points the main character have. In another instance, when we take a look at Ninja like Sasuke [Susano’o] where his abilities relies more on Ninjutsu and you should increase the Ninjutsu attribute. There are plenty of events offering Mood Scrolls and sometimes you can get it at cheaper rate during Sage Treasure event and Daily Special event. You can also purchase Mood scrolls with ingots and coupons. It will cost 15 ingots/coupons per mood scroll. If you want to max out the mood for your ninjas it will cost 2,400 ingots/coupons if you’re looking to purchase them. It will cost almost $48 USD. If I missed some crucial information about mood system, please share with us by commenting below.